Big box retailer Best Buy is holding a 48-hour sale that ends Saturday at midnight, slashing the price of all MacBook Pro with Retina display models by $200, while also offering $100 iTunes Gift Cards for $85. Meanwhile, other Apple resellers have discounted fully loaded MacBook Pro with Retina display BTO configurations by as much as $650, while supplies last. Best Buy's "Hot July Black Friday" sale, which began on Friday and runs through mid-night Saturday, knocks $200 off all standard 13- and 15-inch MacBook Pro with Retina display configurations, in addition to offering a $999 MacBook and a handful of other Mac discounts that can all be seen in our Apple Price Guides. 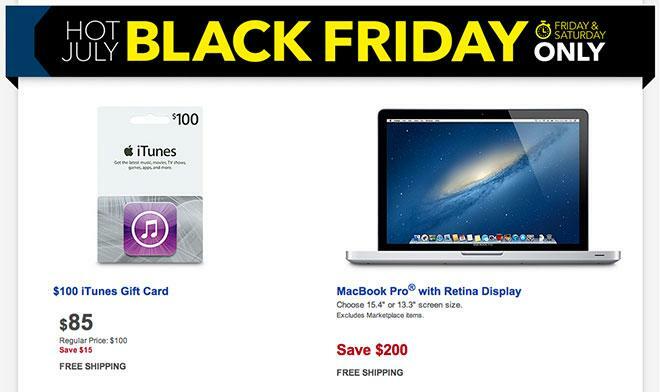 Additionally, the retailer is also offering $100 iTunes Gift Cards for $85. Per usual, Amazon was quick to match Best Buy's pricing on all Retina MacBook Pros. However, Best Buy now charge sales tax on all orders. By comparison, MacMall only charges sales tax in CA, IL, NY, TN, MN, GA, NC, and WI, Amazon only in AZ, CA, KS, KY, NJ, NY, ND, PA, TX, and WA, while B&H Photo only charges sales tax in NY. Therefore, readers not residing in one of the aforementioned states are still bound to find their lowest final price at Amazon, MacMall or B&H, as shown in the guides below. For its part in the discounted pricing, MacMall offers AppleInsider readers the absolute lowest prices anywhere on most MacBook Airs, MacBook Pros and iMacs when using the links in our price guides to activate the Promo Code field on MacMall's product pages and then manually applying coupon code APPLEINSIDER01 for an addition 3% savings. Similarly, B&H Photo offers AppleInsider readers exclusive discounts on AppleCare 3-Year Extended Protection Plans when purchased alongside new Macs, yielding the lowest prices anywhere on most Mac+AppleCare bundles, all of which can be seen daily in our Macs+AppleCare Price Guide.